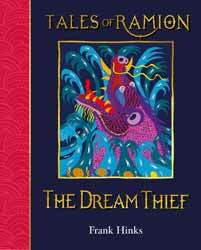 Tales of Ramion: The Dream Thief (Hardback 2018. 77 pages) is a fantasy book aimed at the 5 to 10 age group. The book, like many others in the series, is written by Frank Hinks. Every page has an accompanying illustration, which makes this a perfect book to read to your children. The pictures help illustrate what is going on in the prose. The art can seem naive, but this also provides it with a surreal element. The story involves three brothers, Julius, Alexander and Benjamin, based on Hinks's own children, and their constant companion, Snuggle, the cat. There are a number of books set in the world of Ramion, all of which are told with wit and perils suitable for the reader’s tender age. In the latest volume the Dream Thief has stolen their mother’s dream of being an artist and the boys have to get it back. With Snuggles and a six year old version of their mother they must brave the Palace of Nightmares to confront the Princess of the night. The story is much more innocuous than the previous statement would indicate. Along the way the story often becomes as surreal as the illustrations with the party beset with fishing rod carrying fish and birds with shotguns. Do the boys prevail? Of course they do, the stories are designed to be perfect bedtime tales. It even has a nice moral centre which says that while things may sometimes become difficult everybody’s dreams are important.